The stereotypical image of Mexico City is one of a megacity topped off with a sombrero-like canopy of polluted air. The people are thought to be hustling and bustling around in their cars; from home to work, from work to their homes. And whereas the latter is true for some, there are others that have found a source of inspiration in this place that can, without a doubt, be called the new city that never sleeps. These individuals stick to the Mexican saying: “camarón que se duerme, se lo lleva la corriente” (the crab that falls asleep, is swept away by the sea) and do not lose time to reinvent themselves and their beloved CDMX. They create unique niches, turning this urban space into what makes it so outstanding beyond comparison: a creative hub full of potential yet to be exploited. Meet three of these creatives, who, although they made their dream come true in different artistic areas, share a primordial trait: They started with what they had, right where they were and were not afraid of daring to step into the unknown world of entrepreneurship. 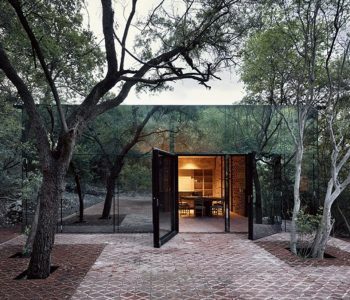 They linked their passions with the rich cultural heritage Mexico has to offer and designed their very own very Mexican projects; tradition embodied by innovation. Ariana, what do you do? 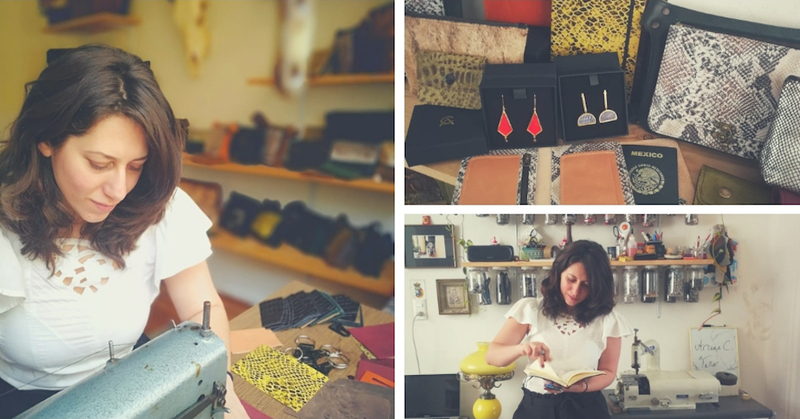 I make leather accessories; purses mostly, but also jewelry and artwork with the small leather leftovers that remain from manufacturing bags. I have been sewing since I was 12 years old; I have just always enjoyed designing my own creations. Then I fell in love for the first time with a punk from the United States who basically self-made everything he owned, and I was extremely inspired by him. I wanted to be able to do what he did. That’s why I studied industrial design, originally to build furniture. Why did you not end up designing furniture? Life! Somehow, I made a purse for myself one day, a friend saw it, loved it and wanted one, too. And then her friend wanted one, as well… And so, I ended up making a new purse every day. I experimented with all types of material at first, until I was invited to a show in Paris, where they wanted to explicitly show goods made of leather. The purses for the exposition turned out horribly! Why? Because working with leather was new to me; different from all the other materials I had worked with so far. It was a challenge to produce leather purses, I had to learn a lot. That’s how you started your business? Yes, I just ended up loving the material, it’s long-living, noble, and, I feel it has a personality of its own. Leather goods accompany you and with every scratch, they become more like you. There is no other material that grows old like this, especially in our society today, where we tend to throw things away so quickly. What’s something unique about your brand? Comfort equals luxury for me. Every bag I create, I design it for myself first and try it out for a few weeks. Then, depending on how comfortable and practical it feels, I either produce more or make adjustments, like putting on different zippers, for example. Especially here in the city, where life tends to be stressful and chaotic, you need to feel at ease with the products you use daily. What would you recommend other young creatives? Of course, I don’t make all my bags on my own anymore. I employ Mexican women and men who help me produce them. Yet, I believe it’s key to understand the whole process, to be able to experience what it means to go through every step of the production. My recommendation thus is to never only focus on the finished product but to be part of its coming into being. 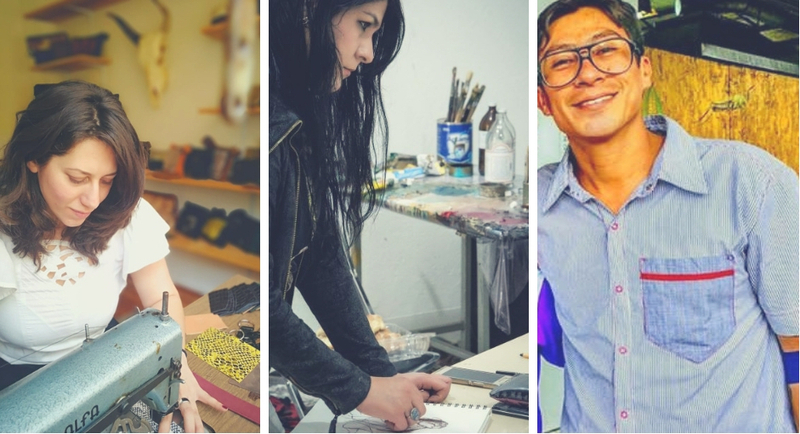 Become an artisan, hands-on! Odette, did you always want to be a painter? I have always painted, yet it had never occurred to me that being an artist could be a real job. As a child, I wanted to be a veterinarian. In my artwork, you can still see that I like medicine: I paint organs a lot, they are a crucial part of my work. I work at “Morton”, an auction market, promoting other peoples’ art, and I also create my own. The idea of my childhood has been proven wrong: Art is my profession! Let’s talk about your art, what is your source of inspiration? I love to read. Mexican literature has definitely influenced me. Jaime Sabinas, for example, and everything connected to the magical realism literary current inspires me. And whereas I have always been encouraged by words, I quickly realized that there are things that I simply cannot express using language. That’s why even before I went to university (Escuela Naciónal de Artes Plásticas, ENAP), I started organizing exhibitions with friends in coffee shops around the city. I have gotten involved in many projects lately, you know what they say, “camarón que se duerme…”. Through a platform called “Programa Internacional Arte Superficie”, which allows young artists to divulge their work, I have sent pieces to Germany and Spain, for example. Also, I will have some of my art at this year’s Cervantino, a huge cultural festival in Guanajuato. And I am really excited about designing one of the enormous skulls that are going to be exhibited in Paseo de la Reforma for the Day of the Dead celebrations. I see that eyes generally appear a lot in your work? With the series “En la sombra estaban sus ojos” showing eyes on a flamboyant watercolor background, I want to represent the vivacity of my country. In Mexico, we receive countless stimuli every day: spicy food, traditional music, handmade crafts. As soon as we walk out the door, we are faced with these colors, forms, sounds, and smells, and is this “Mexicaness” that shows in my work. And what are your future goals? It may sound cheesy, but my goal is to never give up this passion. I cannot imagine my life without art and I want to use my time to improve my skills and create. I go to drawing sessions on the weekend, connect with other artists and always observe my surroundings closely: this city has a lot to offer if you open your eyes to its potential. Askari, you are a writer. Why did you open a restaurant? In 2010 I started a clandestine rooftop-bar in the house I used to live in, in La Roma, CDMX. It was called La Tlayuda Roof and we used to sell mezcal, beer and tlayudas every Friday night. 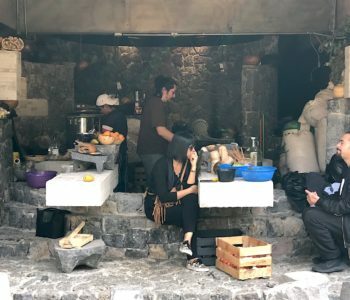 Other writers, poets, musicians, filmmakers, and all kinds of hipsters crowded this underground place until the owner of the house shut it down, “Mucha fiesta” he said. Anyways, at that time, I was given a scholarship to promote my writing and went to Argentina. 2012 I got back and decided to open a real restaurant. As soon as I got back to Mexico City my friends started calling and wanted to know when the next rooftop-session could take place. They missed La Tlayuda Roof and I soon realized that I could not live only off my literature. Together with my associate Alejandro Montes, I opened Las Tlayudas. Not only because it paid my rent but because I felt there was no place in the city that honored the Oaxacan cuisine. 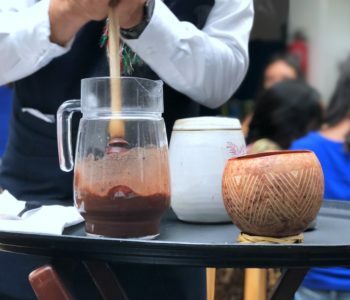 There had been a mezcal-boom, yes, but the Oaxacan food was not available, although it is the greatest specialty Mexico has to offer. You brought Oaxaca to Mexico City. I live with a great nostalgia ever since I left Oaxaca: I miss my family and the food. My restaurant is a reincarnation of both in this city. It’s an homage to my grandmother, her favorite dishes are on the menu. I learned how to prepare them from her and it is as if she lived on in every plate I cook. Her beloved creations are the specialties on the carte du jour, for example, the asiento tlayuda. Asiento is what gives the tlayuda her special flavor. 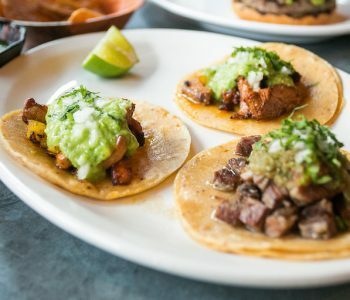 What is a tlayuda anyways? 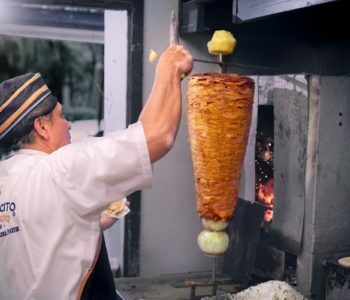 If you have never seen a tlayuda, imagine it as a Mexican pizza. It started as a regular tortilla, yet bigger. Back in the day women in Oaxaca used it to wrap up the food they prepared their husbands, mostly farmers, for their workday in the fields. The men worked and worked and at lunchtime they got out the wrapped-up meal and savored it on top of the big tortilla. I believe that’s how the tlayuda came into being. 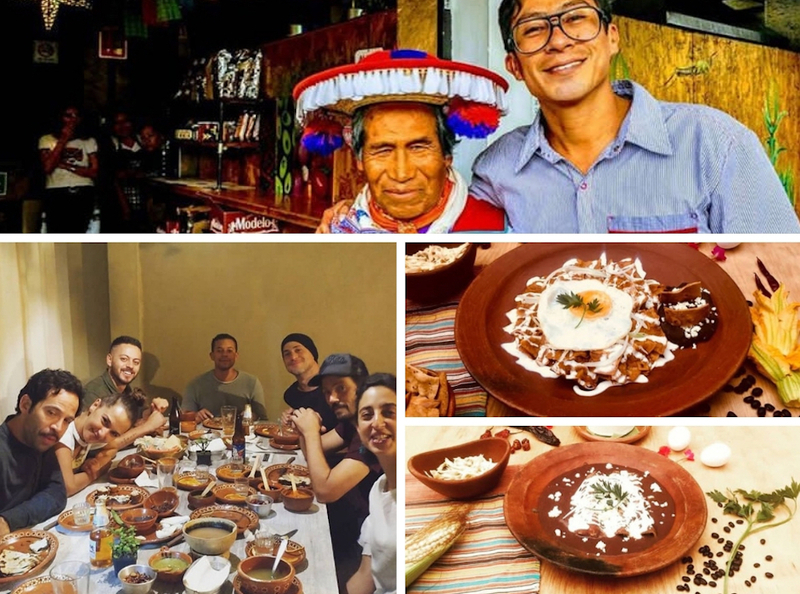 It is the most traditional dish Mexico has to offer and I adore being able to share it with people in this city which is an enormous collage of different types of food. You connect the love of art with the love for food, then. Yes, I sometimes host events in the restaurant, readings or concerts. Great artists, like the actor Diego Luna, have come, and I cooperate with various publishers, amongst others, “nortEstación” that also published my latest book, El Principio de Pascal. What is your latest novel about? El Principio de Pascal shares personal stories of people from Oaxaca, showing a different perspective of the city and its vibe than is known from the Mexico guide books and picturesque advertisements. With the almost non-fictional tales the reader dives into the lives of passionate people that have one thing in common: they seem to not understand the other and the other’s needs. The book links past and present and refers to a conflict taking place in Oaxaca ten years ago. Yes, I believe that if you honestly want to achieve something, and you know what it is you are looking for, you can accomplish it. Really wanting to create, to show, to share with people what you love, will always open any door for you.